How Can Stickers Help You? Artists need to get their work out into the world in order to receive the recognition they deserve, and while word of mouth is a great way for people to get to know your work, an even better way is for them to actually see it. Since there is only one original piece, our restickable, repositionable wall graphics are a perfect way to make those priceless pieces available to a much larger audience. With vibrant colors and clear, strong graphics, our products will help you share your work with the world. Why is Sticker Genius a Great Choice? 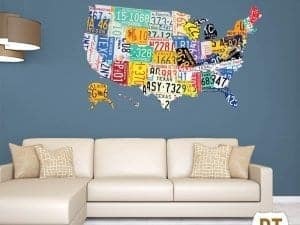 Sticker Genius can take your art and make it easy for anyone to exhibit it in their home without worrying about making holes on the wall or leaving residue that might ruin the paint job. Our wall graphics are easy to position by just peeling the backing, choosing the right spot, and sticking them. And when the décor changes, our wall graphics can be easily moved with no hassle or worries. What Can You Do With Stickers? Stickers are a wonderful tool for promoting your art and brand. Stickers make it easy for you to showcase your work and constantly change it so that potential clients can admire your versatility. They can also be a great way to promote your work in unexpected spaces. What If You Need Guidance or Advice? At Sticker Genius, we are always ready to assist our customers in developing the most efficient, cost-effective plans for how to use our stickers, signs, and wall-graphics. You can always feel comfortable contacting our experienced Stickologists who can offer suggestions and ideas on how to use our products to best showcase your artwork. Artists need to promote their brand and product just like any other business or organization. Sticker Genius can provide the tools necessary for that promotion that are practical and cost-effective. Sticker Genius also provides supportive, experienced customer service agents who can provide help and guidance in how to use our products. Sign up to our newsletter for information about new product releases, product news, and exclusive coupon codes! Unique eco-friendly sticker called "StickleMe" that can be reused rather than discarded every use. All stickers proudly produced in The Genius Lab by our "Stickologist" just north of Detroit. Standard turn around ships within a week. Request rush production for faster turnaround. Proofs are sent for all custom orders via email for your approval before going to production. We utilize print technology that allows a higher color gamut output and resolution than most printers. All U.S. orders over $50 receive free shipping. Expedited shipping options available. We ship internationally. Your shipping will be calculated during checkout. Follow us to stay up to date with our lates sales & news. All sales in USD. Free Shipping on orders over $50 only valid for United States orders.